We were first introduced to Junior Lewis's work through our friends, artists Paula Joerling and Tom Haney of Atlanta, Georgia. 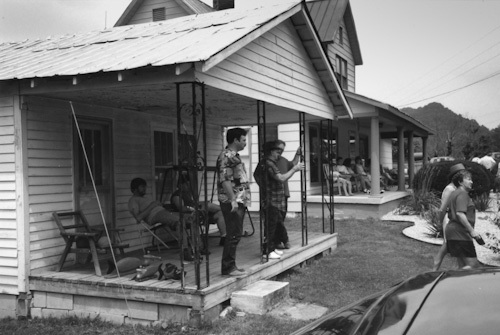 They had visited Minnie and Garland Adkins who then provided directions to a baker's dozen of artists that lived within a fifty mile area of Peaceful Valley! Junior was making his brightly painted devils and devil boats at the time. They purchased some of his work and later provided a play by play of their tour with scanned photos of some of the artists' and their work. It sounded and looked as round about as some of our adventures. 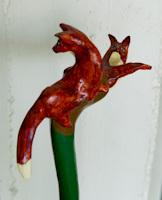 We purchased Junior Lewis's "fox cane" during our trip to the Moon Fest in Moon, Kentucky. Minnie Adkins had suggested that Tim, Jim, Junior and some of the other carvers from the Isonville area be present with work available for sale as collectors would be in town at her behest. We had not purchased work from Junior up to that date in 1994. We liked the stick cane with fox hole and foxes which was a significant departure from his previous devil themed work and enjoyed supporting in some small way his pursuit of carving. We were saddened to hear Junior died suddenly and with no prior signs of ill health in August, 1999.